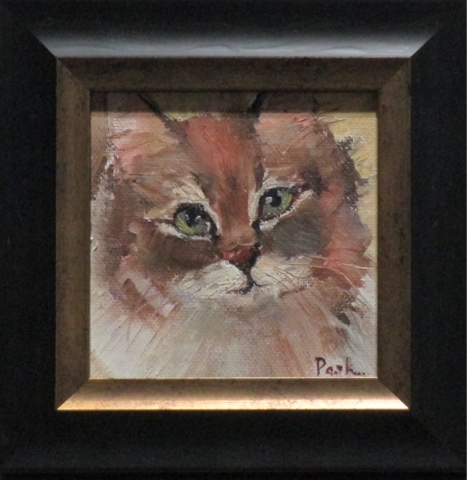 Hi Friends, this little cat is painted on a 4" x 4" stretched canvas and framed in a custom frame, black and gold. Framed it measures 6" x 6" . I am offering this with a buy now option, $65 and I pay shipping anywhere within the continental U.S.
Fall is here and it's just lovely, my favorite time of the year. Thank you so much for your visit. Thank you Hilda! I'll be over to visit. Hi Barbara. I have just enjoyed seeing your wonderful paintings. You are a real talent with that knife! Love this kitty - especially the eyes. I will be back. Wonderful painting! An that cat is adorable! Oh thank you so much Julie, love your work. Thank you large dining tables' please visit again.